SLEEP OUT FOR ONE NIGHT … SO HOMELESS YOUTH DON’T HAVE TO. The Sleep Out Movement is an opportunity for all of us to come together and make an immediate and lasting impact on the homeless young people who live at Covenant House. While the Sleep Out does include taking a piece of cardboard and a sleeping bag into a parking lot, the Sleep Out is not about pretending to be homeless. It’s about showing a group of young people unconditional love and absolute respect – proving that you care enough about them to be uncomfortable for one night, to be vulnerable so they can be safe. The funds raised by Sleep Out participants are put to work immediately, keeping the lights on and the doors open for the thousands of young people who will seek our help in CA this year. Our youth are changed by every interaction with someone who cares, and their dreams become a little more reachable every time they hear, “you can do it. I believe in you.” The Sleep Out offers every participant the chance to be someone who cares. 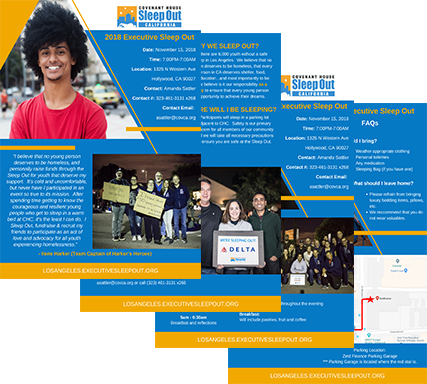 Download Details for the Los Angeles Sleep Out! 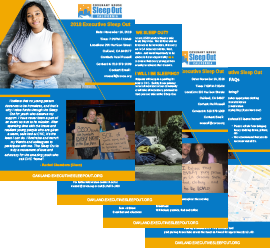 Download details for the Oakland Sleep Out!